It seems strange – walking the path that the young John Constable took to school. 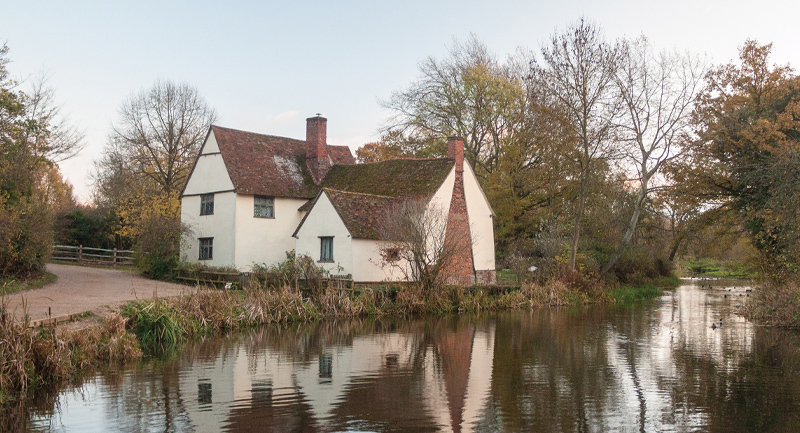 It seems strange too standing on the spot where ‘The Hay Wain’ was painted, but that’s what happens when you explore East Bergholt and the beautiful countryside around it. I turn off the A12 and follow the sign to the village and minutes later find a free car park behind The Red Lion. The first thing I notice is the caw of the squabbling rooks building twiggy nests in the tall trees. An information board welcomes me to the birthplace of John Constable – with its eighty listed buildings. I head for the High Street passing Chapel House where clumps of purple heather add colour beneath the rose bushes. Across the street I see Dunthorne Cottage – nowadays a Bakery and Patisserie, but once the home of a friend of the famous resident. I peep inside and decide there and then to end my walk with a treat from the array of homemade cakes and pastries. But first – the walk itself. I wander down Cemetery Lane passing a former studio of John Constable and a red brick Congregational Chapel before coming to open countryside stretching for miles beyond a farm gate. I take a narrow footpath that drops down to Fishpond Cottage – its red tiled roof snug in the valley below me. Black-face sheep pause to stare as they graze among old apple trees where a robin sings. Thick fallen leaves soften my footsteps. I cross a gravelly road and take the very muddy path up the hillside. My boots become heavier with every step! At last I come to the hedge-line and here I turn left to walk down Dead Man’s Lane towards the flooded fields in the river valley. Hawthorn branches create a tunnel above and a trickling stream shares my path, now lined with Dog’s Mercury and yellow stars of Celandines. Soon I stand looking over the flooded pastures and turn left into Donkey Lane. The river Stour, to my right is beyond elder bushes just beginning to show green. I duck under low branches of oak trees and avoid stumbling over their roots. More sheep graze in a meadow on my left.